An artist's concept of a NASA Orion spacecraft being attached to its Space Launch System megarocket. 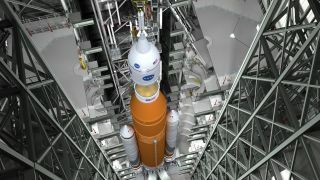 NASA officials said May 12 that it will delay the first test flight of the giant rocket and Orion from 2018 to 2019, and will not fly astronauts on that first mission. The first flight of NASA's next-generation heavy-lift rocket, the Space Launch System (SLS), is now scheduled for 2019 and will not include a human crew, agency officials said today (May 12). As of 2016, NASA had planned for the SLS' first flight to take place in 2018, without a crew on board. But the transition team that the Trump administration sent to the agency earlier this year asked for an internal evaluation of the possibility of launching a crew atop the SLS inside the agency's Orion space capsule. The internal evaluation "really reaffirmed that the baseline plan we had in place was the best way for us to go," Lightfoot said. "We have a good handle on how that uncrewed mission will actually help [the first crewed mission of SLS] be a safer mission when we put crew on there." SLS' first flight will be called Exploration Mission 1, or EM-1, and will send an uncrewed Orion capsule (which has already made one uncrewed test flight, aboard a United Launch Alliance Delta IV Heavy rocket) on a roughly three-week trip around the moon. The first crewed flight, EM-2, was originally scheduled to follow in 2021. Lightfoot said NASA has been "looking at the schedule for EM-1 for a while now," following various issues that have delayed multiple aspects of the mission, including tornado damage to the agency's Michoud Assembly Facility in New Orleans earlier this year. The core stage of the SLS and its main propulsion system, along with structures for the Orion spacecraft, are slated to be built there. "When we did the crew study, it shined a little brighter light on what we needed to do moving forward," Lightfoot said. "We now know we're going to have to move that [EM-1 launch] date into 2019." The decisions regarding EM-1 were made jointly by NASA and the White House, Lightfoot said. Lightfoot said the SLS team has yet to confirm the formal launch date for EM-1 but will likely do so within the next few months. The delay will also push back the expected time frame of EM-2, according to Bill Gerstenmaier, associate administrator for human exploration and operations for NASA, who also spoke during the teleconference today. As of 2016, the crewed EM-2 flight was scheduled to take place in 2021, but Gerstenmaier said there would be a minimum of 33 months between EM-1 and EM-2. He said the exact date of EM-2 might not be announced until after EM-1.